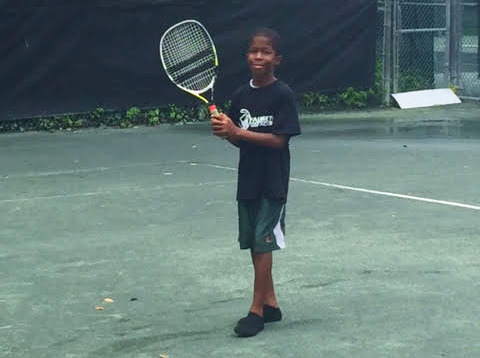 “I think I love tennis” says Kamari (age 9) a rising fourth grader at Charles Drew Elementary School. Miami Children’s Initiative (MCI) hosted its 2nd annual Liberty City Kids Day at Crandon Park Golf Course in Key Biscayne. The sports extravaganza was hosted in partnership with the Key Biscayne Community Foundation, the Chief Press Charitable Foundation and the golf and tennis aficionados with Arraya Tennis Academy and Crandon Golf Academy. The day featured 118 students, all inner city residents of Liberty City and participants of the MCI summer camp programming. In addition to our eager and bright-eyed students, the day was supported by 14 golf and tennis instructors, Melissa White of the Key Biscayne Community Foundation and Chief Press of Key Biscayne, in addition to 18 chaperones (consisting of volunteers and MCI staffers) each committed and dedicated to exposing each child to a world outside of their neighborhood. While the day saw intermittent episodes of rain, spirits remained high and students were enthused at how their minds and bodies responded to their individual/group clinics. Liberty City Kids Day is not an everyday field trip designed to engage and occupy the time of 118 children. This herculean effort is designed to ensure lasting change in the future of each child it touches. Each child had a new experience, a new feeling, a new thought and a different dream, and that’s the MCI Way.